Time is absolutely of the essence, especially for those who’ve decided to buy a home. The mortgage process is complex, and there are several significant steps that can be successfully taken to get the deal done and done on YOUR SCHEDULE. 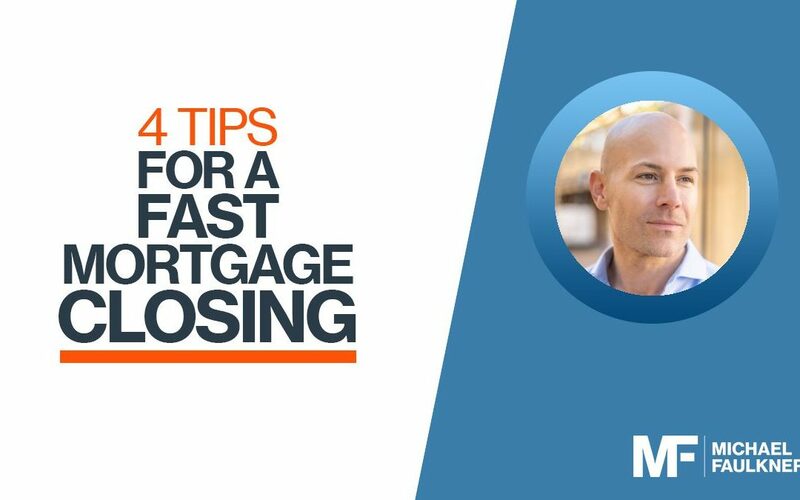 In a competitive market and with such high stakes, nothing is more advantageous than a fast closing. Take a look at these four tips that can help ensure buyers close quickly and STRATEGICALLY, so they can obtain their ideal home. Nothing can be more crucial to the loan process than putting together a team that will construct a mortgage plan that meets the needs of the buyer. With so many promises made online from outside lenders, it can be easy to just find the one that promises the lowest interest rate. This is not a winning strategy since many factors determine the rate. The right lender will not make any upfront promises about rates, instead a reputable lender will do due diligence in securing a favorable rate and mortgage plan. When buyers land the right lender, they’ll be better able to make decisions that are financially prudent because they will know the WHY behind the mortgage. This is the only way to know YOUR FULL FINANCIAL POTENTIAL. Once the buyer feels comfortable with his or her lender, it’s time to get underwritten pre-approved. Unlike a prequalification, an underwritten pre-approved is a commitment to the buyer that funds are locked and loaded. Buyers hoping for a rapid mortgage closing can opt for a more thorough application process and review of financial details. This process stamps the buyers with a firm pre-approval, signaling to sellers that they are more than ready to make a competitive offer. Keys on Time and SecureLock, two of our innovative home loan programs, give buyers the tools to succeed and EXCEED their expectations, especially if they want speed through the closing process. Keys on Time is a 20-day program fueled by the power of a full loan approval. This feature allows buyers to tower over the competition with its aggressive close time and financial backing. SecureLock is really about peace of mind. In an unpredictable market, buyers can lock in today’s rates while they plot and plan their next move. This may be ideal for buyers selling a home or for those who need a little extra time to survey the market. The ideal lender is communicative and responsive – and so should you. Buyers aiming to close their home quickly, must be ready to respond and act upon the request of real estate/mortgage professionals. Working together, and following a plan, are all keys to successfully and efficiently getting through this exciting time.